We had a remarkable response to our call for entries for a group show on the subject of Conflict. We decided to choose ten winners rather than five, and here they are! You can see the group show Here. "Almost daily, we bear witness to graphic violence and despicable acts via technology and the media. War and murder are rampant. We've become afraid to travel, speak to strangers, to listen to ideas different from our own. Though the prevalence of these fears seems modern, the root of them is ancient. Fear of the 'other' is as old as humankind. "It is ironic that a basic premise of every spiritual philosophy and religion is to love each other, yet for thousands of years, humans have found empathy so elusive. Righteousness becomes an excuse for prejudice and hatred. Those who are different must be shunned or destroyed. "So how do we free ourselves from fear of the "other"? Philosopher Eckhart Tolle says 'Love is the recognition of yourself in the other; the recognition of oneness.' History has proven that great accomplishments can come from dark times. It is the spirit of inclusiveness that will strengthen society and bring us together. It is with acceptance and kindness that we will survive as a species." 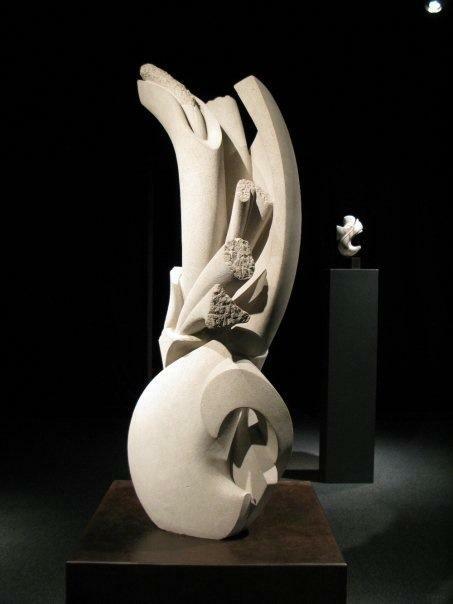 66" X 22" X 22"
This sculpture is carved from a very special stone. "It's Indiana Limestone that was quarried, cut to shape and shipped to The Pentagon for post 911 restoration work, but ended up being a surplus stone. Long story, but I acquired two such stones; one remains uncut. War took two years to carve. 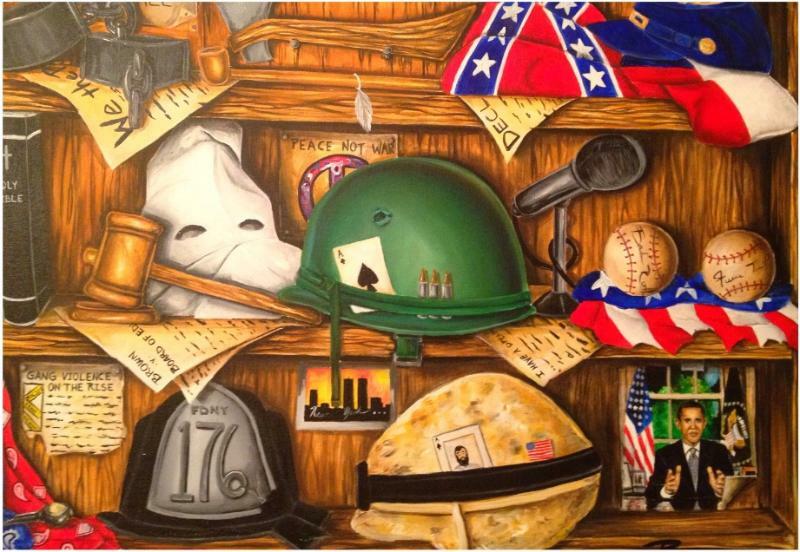 "The title, War, is not a reference to 911, but a symbol of how everything, and specifically every form we know, is the result of conflict. Or as I like to think of it, the combined result of the forces of conflict and cooperation." 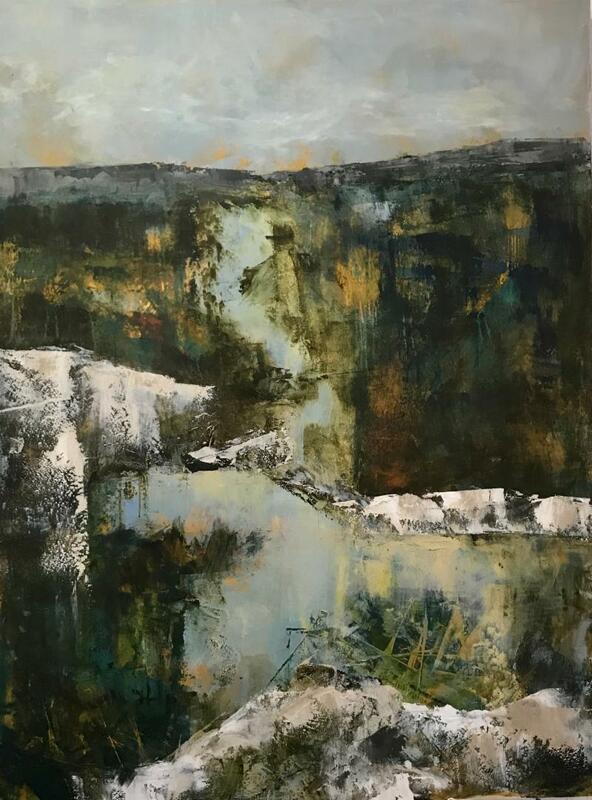 Julie Fritz's haunting Limestone Canyon explores the theme of conflict not in terms of subject, but through technique and composition. 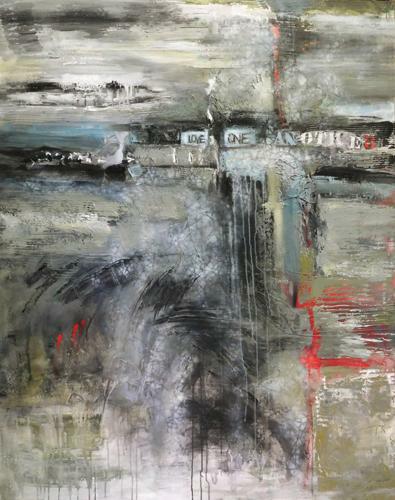 "Although the work is inspired by a rugged canyon in Texas, I purposely brought in many other aspects of conflict. The strike in the drop of the land against the fall of the water, the smooth and textured application of paint, and the light and dark areas of the composition and the land." Deborah Stevenson's collage provides a surreal take on the classic tale of the bound man. Several versions of the tragic tale of Laocoon and his sons have survived from Greek and Roman mythology, but in each Laocoon is strangled by serpents. 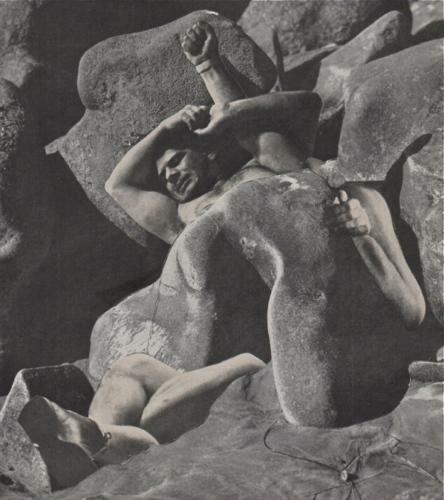 In Stevenson's version, Laocoon appears to be held by his own arms and legs, suggesting a powerful internal struggle. Conflict is sometimes within ourselves. 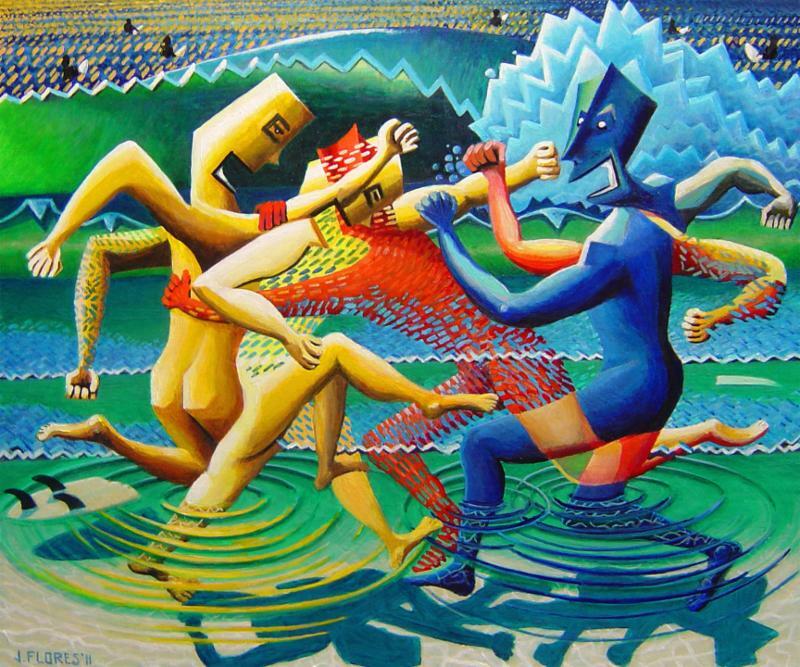 Juan Flores' vibrant, quirky painting The Fight records the memory of a dispute over right-of-way. The drama is heightened by the seemingly time-and-logic-defying number of flailing limbs, and the absurdity of the conflict is recorded with strange faces and vibrant colors. 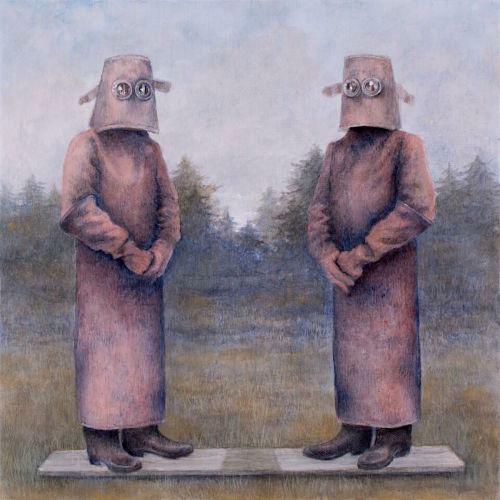 "My newer works synthesize and illustrate a vision rooted in my past. I use intense colors to make vanishing memories into vivid images and recapture a fading dream or a distant event." Peggy Hinaekin's limited edition etching Reflections tells the story of a conflict between two women. 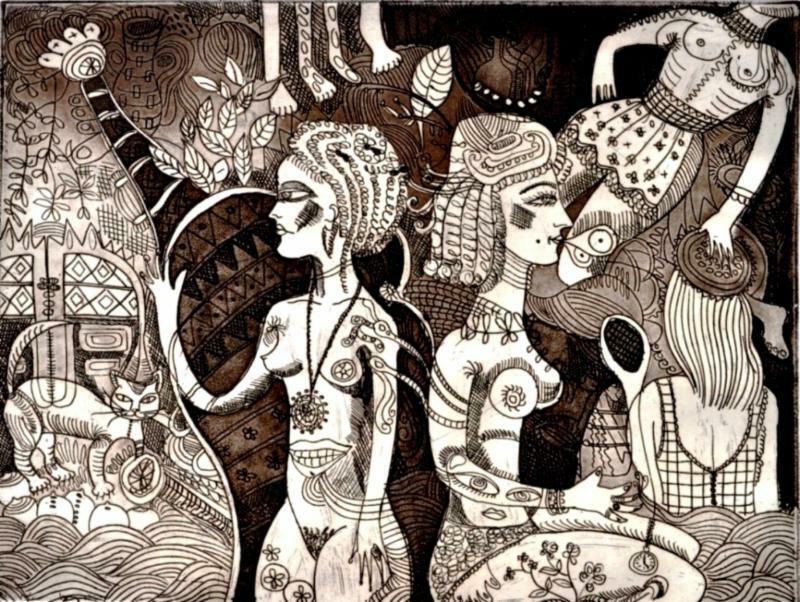 The motifs and symbols woven into the lines of the etching invite you to create a history for these women, and to compose a narrative describing the details of the conflict. They face away from each other, but they're also tied together with lines of pattern and icons of mysterious meaning. 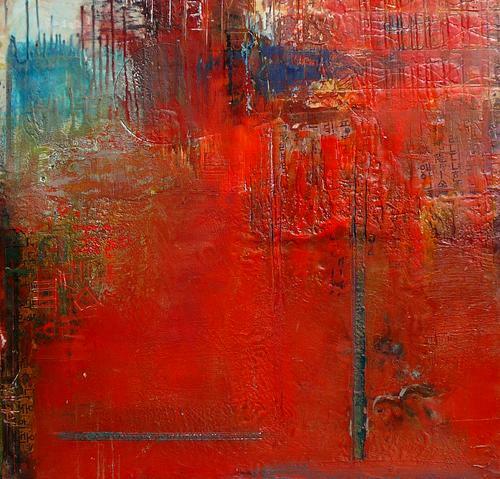 Alan Soffer's vibrant encaustic uses abstract color and form to ask complicated political questions. Soffer's work is always influenced by mythologist Joseph Campbell, who studied the stories that have connected us as humans throughout the ages and helped us to make order of conflict and chaos. Acrylics on canvas, painted gallery edge. 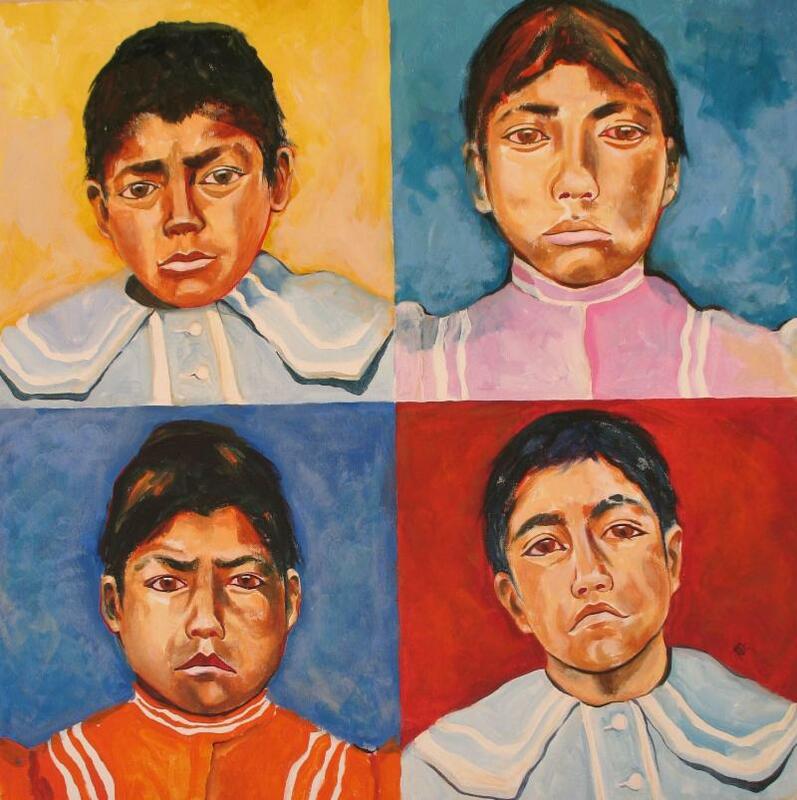 In Karlene Koch Voepel's painting Boarding School, the expression in the eyes of the subjects tells the human story of a shameful phase of American history--one which is sadly relevant again today. Her painting records the victims of a conflict between cultures and even a conflict in the values that shaped our country. "In the 'old days,' Native American children were put in boarding schools to reculturalize them into white society. As you can tell from their expressions this was not necessarily a happy experience. When I first heard of this practice I was horrified. How could these children be taken from their homes and families? The project was not successful and was terminated." B.J.A. 's intriguing piece asks questions about what it means to be American. "When we look at ourselves on a shelf. It is then that we are able to see the truth. That we have and continue to face so many inner conflicts, that have yet to be resolved. But the answers we think are so hard to find have always been there. We are the answers to any and all conflicts we face! We are what make America! Not the things we hold above Americans!" The honorable mentions are featured in a collection on Artspan's home page.